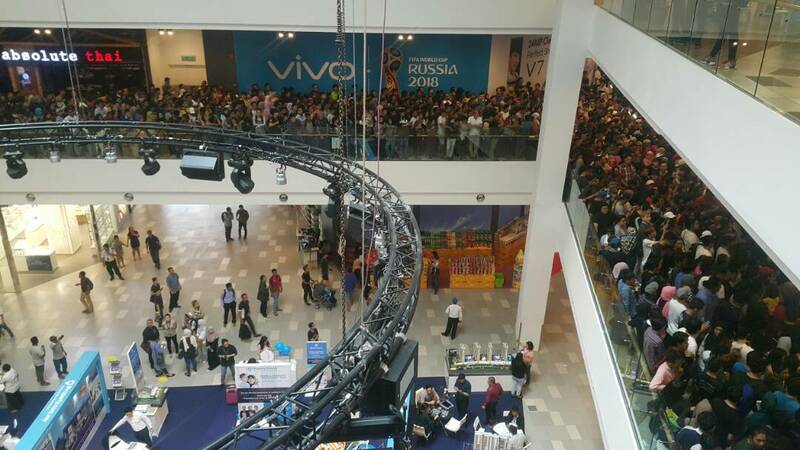 Your social media feed today was probably flooded with images and videos of a crazy crowd at Mytown Shopping Centre in Cheras (that some have estimated to number in the thousands). The reason behind the crowd? Switch, one of Malaysia’s Apple reseller brands had been advertising a three-day Warehouse Clearance Sale, starting today. With prices of iPhones, Macbooks, iPads and more slashed by a few hundred ringgit in some cases it’s no surprise that many Malaysians were eager to get their hands on that sweet Apple tech. However, despite Switch’s attempts to warn the crowd that no midnight queuing was allowed, the lines started yesterday night. According to various posts and comments on social media, some of these ardent queue-ers had brought beds and chairs and were ready to wait out the night for the opening of the store today morning at 10. With anticipation high and the crowd snaking out as time passed, it’s hardly surprising that it went all out of control today. In a pinned post on its Facebook page, you can see how the situation just spun out of control just based on Switch’s time-marked updates. Dear customers, due to safety concerns, MyTown management had instructed the queue to start at Grab station IKEA. We apologize for any inconvenience caused. Dear customers, because our staff’s safety was compromised during the start of the number distribution, the police are currently assisting with the queue. Please be patient and await further instructions, we are working very closely with the authorities and Mall’s management. Your safety is our priority. Thank you. Dear customers, much apologies. We are no longer distributing queue numbers. Due to the excessive turn up and safety concerns, the Mall management have decided to open the entrances into the Mall. The Police and Mall Security is currently directing the queue in gradually. Please proceed to queue inside the mall in an orderly fashion. We will honour those who have obtained the numbers prior to the commotion incident. Again, we are truly sorry & thank you. 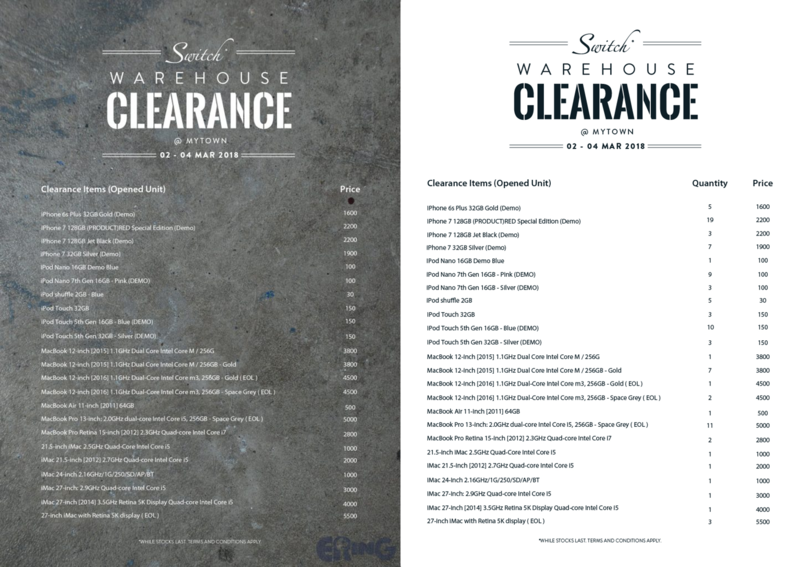 The Clearance sale has already started. However if you’re on your way to MyTown, or are currently in the queue outside the mall’s building, we would highly advise that you to not proceed with the queue, as we might not be able to fulfil all of our customers’ requests today. 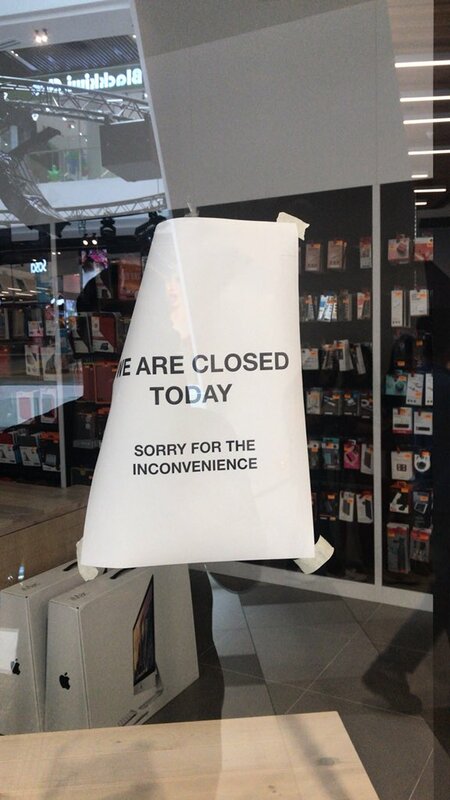 Things came to head with the very unsurprising announcement that the outlet will be closed for today. Predictably, backlash against Switch and its management of the whole situation started. A sale that was meant to bring them more clientele and attention has seemingly backfired on them. The way the event was run shows a lack of foresight. Lining up for hours or even a full day before a massive sale is not a new phenomenon, both internationally or even locally. In fact, Switch has already had a virtual taste of this during the 12.12 sales, where its website crashed due to the influx of users coming in at one go. Worse is when users reported that the website logged them into a different profile than their own, which opens up risks for people shopping on someone else’s accounts, and exposure of sensitive details. We think they really should have seen this coming, considering it’s happened before and that this event has been covered by quite a few publications prior to its opening. But the lack of foresight seems to have extended beyond that. Certain netizens are pointing out that it was unrealistic of Switch to expect a 3-day sale when their inventory was so limited. Additionally, not all of their marketing materials were forthcoming about the limited quantities of items. Perhaps Switch called it a “warehouse” sale to indicate low prices, but we can understand that people might misconstrue it to mean a large number of items as well. In all fairness to Switch though, we do think that the certain public outrage about them making their sale “viral” is a little unfair, as a viral post isn’t just a button you can press. We don’t think Switch truly expected for the huge surge of customers lining up. Once multiple publications got wind of the news and the word spread like wildfire on social media as well, perhaps Switch could have had time to sit and think about crowd control—especially when customers were already lining up the night before the sale. There seemed to be an attempt to warn customers against that practice, but unfortunately, this was not met with enforcement. 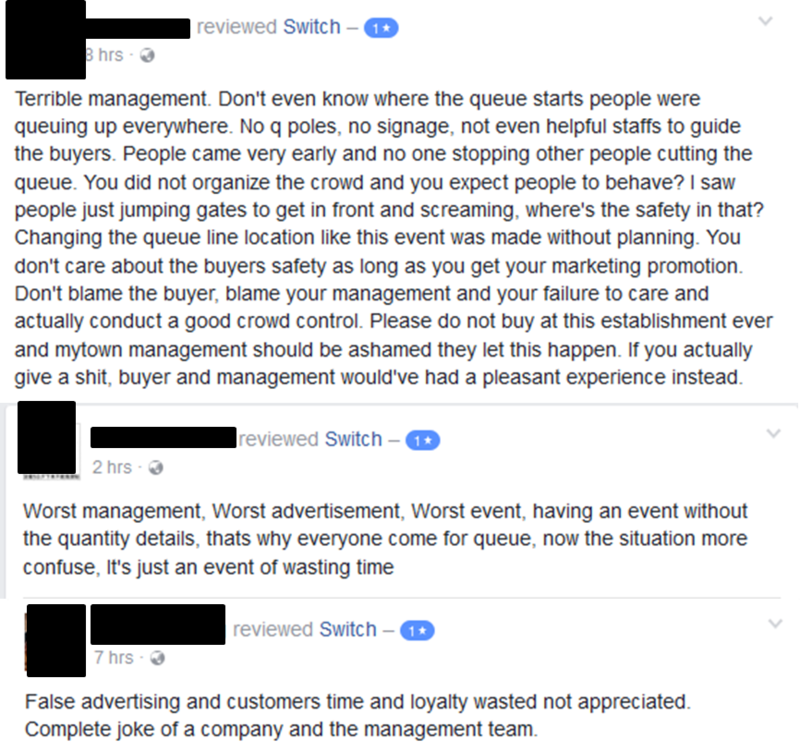 Similarly, during the event itself, many customers were complaining about queue-cutting that went unpunished. Based on comments, Switch did have a few staff on the ground early today and even tried a queue number system (which was subsequently scrapped), but withdrew them, possibly due to safety concerns. Trying to sell in Malaysia means it’s crucial to understand your Malaysian target market. After the furore today, what is mainly impacted is brand trust. If they’ve already brought prices down so much before, then are people going to be willing to pay for full-price in Switch next time? Or, perhaps the bad publicity could lead interested Apple owners into other resellers instead. At the end of the day though, if Switch does conduct another warehouse sale, we think that people will still go. If the Switch MyTown Warehouse sale proves anything, it’s that Malaysians will go to any lengths to chase a good discount. Couple that with a coveted brand like Apple, and you’ll attract droves of eager buyers. In this case, Switch got the short end of the stick, but that won’t stop a new crowd from forming the next time prices are cut to this extent. A suggestion to help might be to limit access to the sale in the first place. Either through an online competition or a lucky draw (ideally held in an open field with ample parking), where potential customers can queue up for a chance to attend the sale and buy products at exponentially cheap prices. Despite this, Switch still does have the advantage of Apple’s strong international branding. Even if resellers destroy their own image, Apple’s products will still sell, and many Malaysians are not too fussed about where the product came from, as long as it’s cheap (or cheaper than the original retail price). Unless public opinion has truly soured on them and all of their stores, we can’t really see a huge loss on Switch’s part, money-wise. But perhaps they’ll need to put in some work to fix their image in the eyes of public opinion.